"Bryan & Jenise took time with us, no rushing. Bryan helped pick the right color and type of carpet. Jenise was very helpful as well. Tom our installer was very detail oriented and very quick & efficient. Definitely knew what he was doing. Thank you! We would definitely refer others. Customer for life! Thank you! We will be back! Happy New Year!" 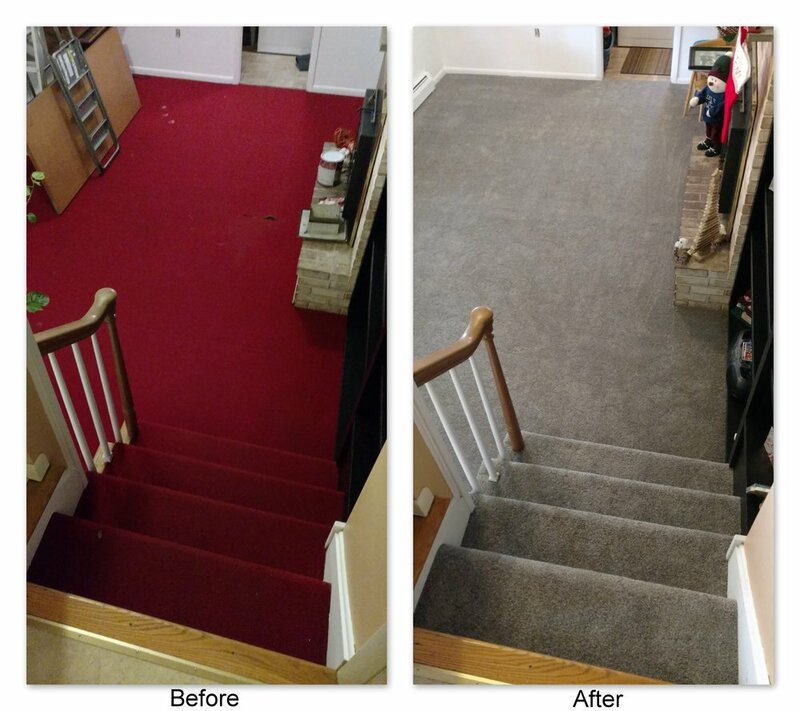 From crooked old runner to classy grey multiflec, Frank & Tonya's carpet choice of Tigressa SoftStyle Sakti Carpet in the color Sundial drastically updated their hall to a modern look. 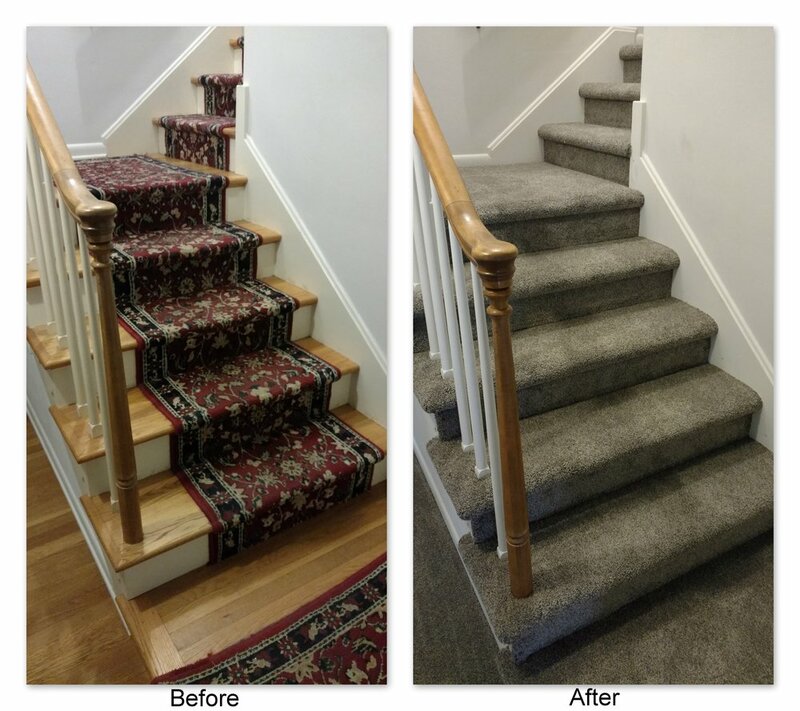 From worn old stair runner to classy grey modern multiflec, Frank & Tonya's stair carpet choice of Tigressa SoftStyle Sakti Carpet in the color Sundial drastically updated their entry stairs to a contemporary style. From ugly regal red to classy grey multiflec, Frank & Tonya's carpet choice of Tigressa SoftStyle Sakti Carpet in the color Sundial updated their sunken family room from 70s red into an inviting space for the grandkids to play! "Bryan was excellent & helpful. Chad the installer did a very good job. Our experience with Elizabethtown Flooring was very good. We would refer others to Elizabethtown Flooring." "Bryan has always been helpful, friendly, and very timely in getting back to me on questions or info on our rug purchase & blinds. Our installer Ed was very efficient, fast, and very concerned about clean-up in the area and gave tips on keeping dust/static off of the blinds. I would highly recommend Elizabethtown Flooring and the whole team. Jenise has been helpful also - my friends have already seen the great results." "Your team member Bryan was very great, responsive, informative. Our installer Tom was friendly, did a good job. Our experience was great - we would refer you to others." "Bryan was very helpful in helping me find a good color for the different browns in the kitchen. Our installer Tom is a nice guy, also professional, always willing to go the second mile. Our experience was good - we would recommend you to others." "Bryan answered all of my questions and provided flooring samples for me to choose from. My installer Marc did a good job and was informative in his process of installation. Marc was friendly and easy to talk to. I am satisfied with my overall experience and would definitely refer E-Town Flooring to others."